You will need to have a Raspberry Pi and Micro:bit for this to work. You will need to install MU on the Raspberry Pi to flash the micro python script. You will need to keep the Micro:bit plugged into the Pi usb port. 4. 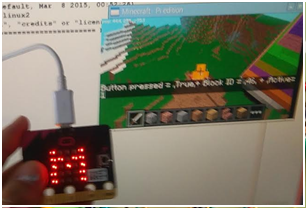 Press the A button on the Micro:bit, look at Minecraft and you should see a TNT block has been dropped. Whack it to see if it is active or not!